A Rosenberg ECFanGrid consists of series of EC fans used in parallel. 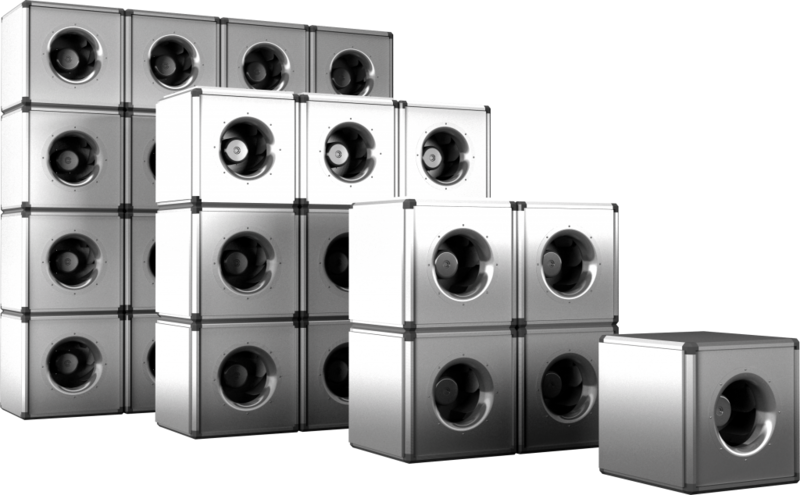 The resulting air flow is proportional to the number of fans used, with the pressure conditions remaining the same. Fan units can be joined in any quantity or arrangement – 1×3, 2×2, 2×3, 3×3 – for virtually limitless application flexibility. 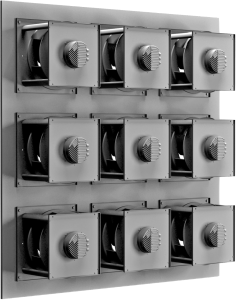 The use of electronically-commutated (EC) fans is not only highly efficient, but they form a perfectly matched unit for a cost-effective “plug and play” solution for individual ventilation requirements. Comprehensive testing has been carried out in our certified testing facility and results are available for the asking. A white paper with design recommendations, as to how to apply a Rosenberg ECFanGrid, is also available for download. When applied in a typical air handling unit (AHU), a Rosenberg ECFanGrid offers excellent possibilities to optimize all available floor space. For example, compared to a single large radial fan, savings up to 50 % in footprint are possible. Further, the distribution of the air velocity over the entire duct is much more even. This increases the efficiency of downstream components and compensation sections can be made shorter. A Rosenberg ECFanGrid is ideally suited for the use in retrofit projects particularly where a single large radial fan is being replaced. Dismantling the old fan, reducing it into pieces, is the only manageable method for removal. Further, installing the new fan becomes the an equal challenge when working with single large radial units. 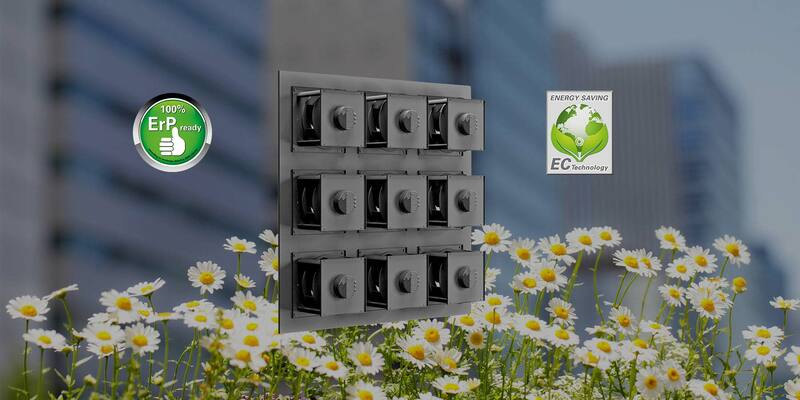 However, when using an ECFanGrid, installation is not an issue mainly due to the modular design, which allows the unit to be built directly on site. Also, a key feature is that the modules fit through standard doors and can be handled by one or two people. Additionally, Rosenberg offers two ECFanGrid construction options: either mount modules into a pre-defined frame, as illustrated in Fig. 1, or use the Unobox design shown in Fig. 2, which is self-supporting and stackable. When a redundant system is a requirement, the Rosenberg ECFanGrid is the logical choice. For example in a data center, a total system shutdown would result in massive costs. The common approach to get redundancy is to place a second identical system beside the operating unit. Not only is this inefficient, but also doubles the required footprint. However, if one fan fails when a redundant ECFanGrid is used, the remaining fans can maintain the operating point by having their speed increased. In addition only the open cone has to be closed. To receive additional information about redundancy or other design and performance questions, download our recently published white paper, ECFanGrid™: Technical Information on Paralleling Fans. These videos show actual retrofit projects, in which old belt-driven radial fans were replaced with Rosenberg ECFanGrids. ECFanGrid: Technical Information on Paralleling Fans A Rosenberg ECFanGridTM consists of a series of EC-Fans used in parallel. The resulting air flow is proportional to the number of fans used, with the pressure conditions remaining the same. Download the white paper to get complete technical details about paralleling Rosenberg EC fans. Rosenberg has documented seven reference applications in one PDF file, in which old units are being replaced by ECFanGrids, reducing footprint, increasing reliability, and simplifying future maintenance. Download now to see how ECFanGrid provides a better solution to air movement challenges.